Brothers Become Paralyzed at Night. Are They Solar Kids? Solar energy is being accepted on a large scale. We have so many solar gadgets in the market these days. But have you heard about solar humans? Human beings who get charged by sunlight and as the sun goes down they get paralyzed. Recently two such cases were found in Pakistan that baffled the medical community. 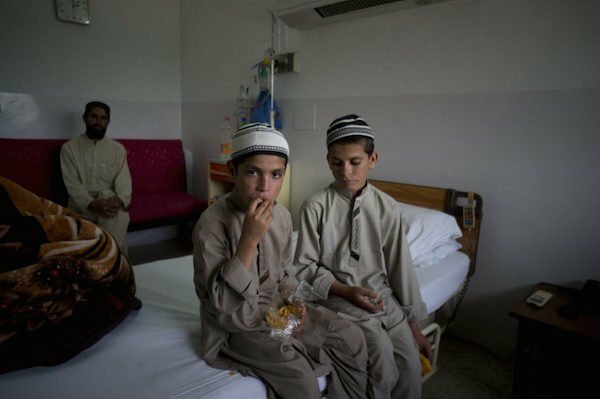 Abdul Rasheed, 9, left, and Shoaib Ahmed, 13 are active during day but get paralyzed at night. Abdul Rashid aged 9 years and Shoaib Ahmed aged 13 are brothers who live in Mian Kundi, a small village near Quetta. During the day these two brothers play like normal kids, but once the sun sets they are not able to move and they even cannot talk. Mohammad Hashim their father says that his sons get energy from the sun and so the village calls them ‘Solar Kids’. Mohammad Hashim and his wife are first cousins. They had six children, two of their kids died when very small. Out of the surviving four only two kids show these unusual symptoms and the other two are normal. Shoaib and Abdul wake up with the first rays of the sun. Like other kids they complete their household chores and then go to school. Till late afternoon they are full of energy and excitement but as the sun sets their activity goes down and their energy starts dropping. When the sun sets completely the kids become paralyzed, they do not talk or move. They remain in the vegetative state till the next morning when the first rays of the sun fall on them. According to the parents the kids were like this since their birth. The kids were admitted in the Pakistan Institute of Medical Sciences (PIMS) in Islamabad for diagnosis. “It is a rare medical condition, we have never encountered before and we are investigating it.” Dr. Javed Akram, Chancellor at Pakistan Institute of Medical Sciences said. He said that he and his colleagues had taken the case as a challenge. A board of nine members was formed for the diagnosis. The doctors did many medical tests and their blood samples were sent to many international collaborators including Mayo Clinic and John Hopkins Medical Institute in the U.S. and Guys Hospital in London for detailed examination. Soil and the air samples from their village were also collected by the researchers. Dr. Akram said the government was providing free medical care to the siblings, who came from an impoverished family. The doctors kept the boys in complete dark rooms during the day but found them to be active and did not notice any unusual symptoms. So, Mohammad Hashim’s claim that his sons got energy from the sun was discarded. Also, it was found that the boys were normal when it was cloudy and even during rainstorms they were active. The parents of the solar kids are first cousins, the doctors believe that even this might be the reason of the unusual disease. Doctors said that there was one good thing about their illness that it did not worsen with time. Till date the doctors have not found the cause of this unusual illness but they have been successful in improving the condition of the brothers. The newspaper in Pakistan reported that a few days ago the boys moved around at night for the first time. Shoaib and Abdul hope to recover completely and lead a normal life. Shoaib wants to become a teacher and Abdul wants to become an Islamic scholar. Its only because of the efforts of the doctors that Shoaib and Abdul are hoping to get better from this strange and rare disease. But the cause of their bizarre disease remains a mystery.